My friend Courtney chimed in that it might be a Midwest thing, as she lives in Ohio, and they’re just called “no bakes” down there, too. Maybe, like “pop” vs “soda,” you can always tell where a person grew up by how they refer to cookies of this kind. 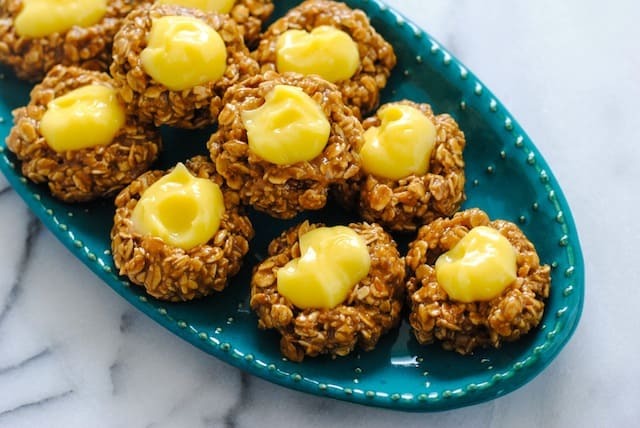 No matter what you call them, they’re really the perfect cookie for summer, and as I’ve recently discovered, you can get pretty creative with them, too. I figured it would be no problem to sub out traditional old fashioned oats with the new Bob’s Red Mill Gluten Free Granola, and I was right. 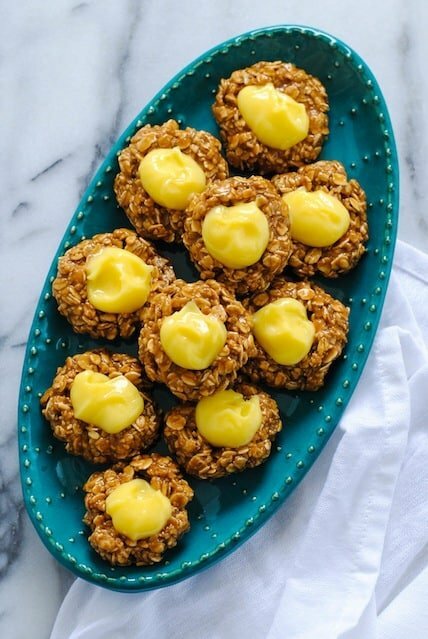 Either flavor would be great in these cookies, but here I’ve used the Honey Oat Granola. Made with whole grain, gluten free oats, these granolas are crunchy and lightly sweet. They’re perfect on top of yogurt or fruit, and it turns out that you can [no] bake with them, too! These granola thumbprints take just 5 minutes to stir up. Once they’re cool, top them with lemon curd or your favorite jam. Place granola in food processor and pulse until coarsely ground. 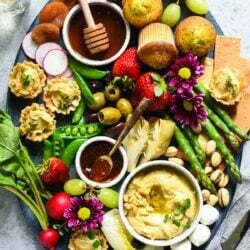 In medium saucepan, stir together almond butter, brown sugar, honey and corn syrup; heat to boiling over medium-high heat, stirring constantly. Remove from heat; stir in vanilla and granola. Let cool 5 minutes, then shape mixture into balls slightly smaller than golf balls. Place on parchment-lined rimmed baking pan; press thumb into each cookie to make an indentation. 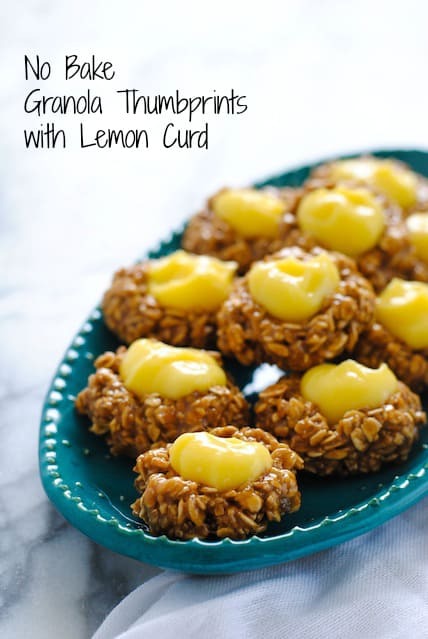 Let cool completely, then fill cookies with lemon curd or jam. Cookies are best eaten the day they are made. 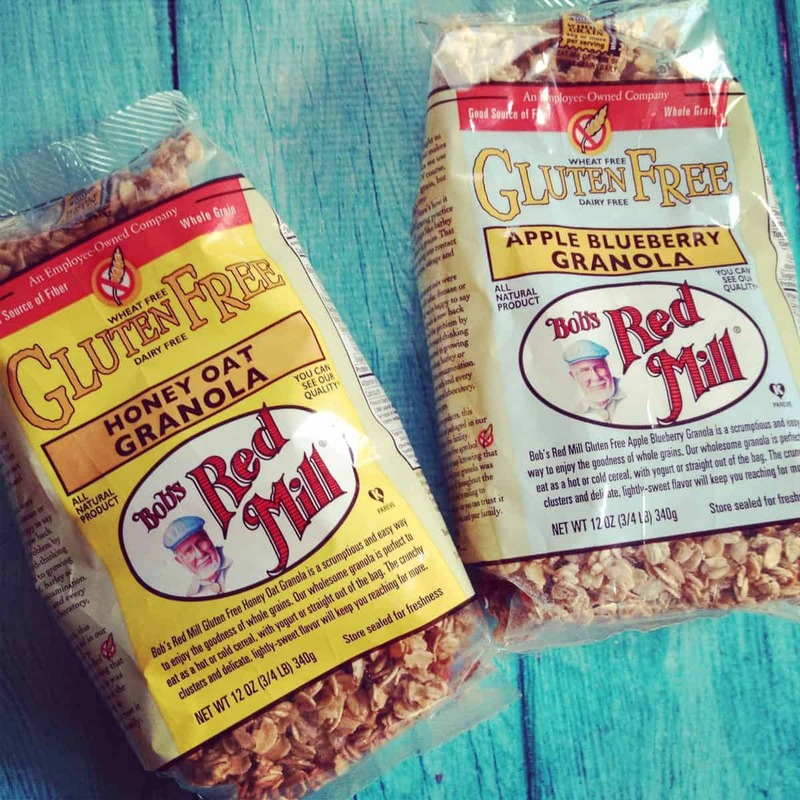 This post was written by me on behalf of Bob’s Red Mill, who provided me with granola for recipe development and giveaway purposes. I was not otherwise compensated for writing this post, and all opinions are 100% my own. I love granola on ice cream. Or with almond milk and fruit as a quick breakfast. I like it by the handful! I like to use them in different fruit crisps in the slow cooker or microwave. My all time favorite breakfast is granola mixed with a banana and cherry yogurt! 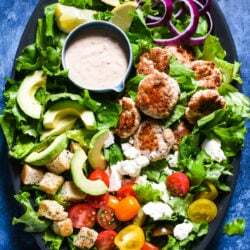 I like it mixed with Greek yogurt and fresh fruit. I mix it in my yogurt in the morning. I have granola every day for breakfast. I love it almost any way it’s served and I can’t wait to make these cookies. My favorite is in yogurt, and I often eat it plain. I love granola over yogurt! I like to eat it plain as a snack! Now I’m craving no bake cookies even more!!! Lovely twist! I like granola with milk or yogurt. i love baking oatmeal cookies using granola! I love granola sprinkled over Greek yogurt with berries. I like it for breakfat with soymilk. I like to mix it in fruit yogurt. Thanks! i love topping my yogurt with it! I love granola with milk as cereal! I eat granola plain out of the bag. I like to have granola in the morning with almond milk and strawberries. Besides just plain by the handful, I like to top yogurt or cottage cheese…maybe add fruit. Granola with almond milk is yummy! I eat it as cereal for breakfast. Love it for a late night snack. like granola with bananas and yogurt in the morning. I love granola drizzled over vanilla ice cream. I like granola with Greek yogurt. I love it warm out of the oven with milk! OMG, now I am starving for granola!!! I love it over yogurt with a little bit of peanut butter. I love granola with yogurt. I like to eat granola on plain yogurt. I love adding to fruits like kiwis and bananas. Yummy! I love adding granola to yogurt for breakfast. I love it with vanilla yogurt and fresh fruit. Granola with yogurt is great!! Granola in yogurt for sure is my fav! I love to put granola on top of yogurt and smoothies. I love granola on my pancakes with yogurt. I just like granola in a bowl for breakfast with some Greek yogurt and berries. I like using it in bread. I love granola with my yogurt. I add granola to yogurt. What’s your favorite way to eat, or cook with, granola? I like mixing it in yogurt and fruit or just eating it plain as a snack. Thank you for the giveaway. I love granola as cereal, with milk, or on yogurt. I like granola mixed into Greek Yogurt with a little honey. I love to make overnight oatmeal with granola or homemade granola/oatmeal bars. I like to sprinkle it over my greek yogurt. I love raspberry greek yogurt. I like it as hot cereal. I like to make granola bars. I love eating granola mixed with low fat vanilla yogurt for breakfast. I like yogurt mixed with jam and sprinkled with granola. I like using it with trail mix. I like it as a cereal in the morning, with a little bit of soy milk. In the winter, I’ll heat it for a few seconds in the microwave. I top my yogurt with granola! I like to snack on it by itself. I like granola with milk in a bowl and some honey on the top for sweetness. With milk – like cereal. It appears I’ve been doing it wrong. I love to eat granola bars. I love fresh granola over yogurt in the morning for breakfast. I eat granola in bars as snacks. Thanks for the giveaway… we like to use it as a topping on oatmeal, or mixed with Greek yogurt. I love to eat granola with fresh fruit and coconut or almond milk.